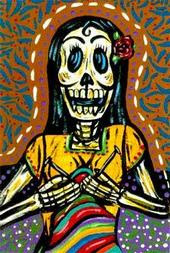 There are NO tears in Knitting!... Okay, maybe. I don't know that I've ever been more frustrated... disappointed... scared... scarred... damaged by a piece of knitting. I really truly almost cried. Here I share my pain so that you may avoid such for yourself. I'm working on a big lacy project with fine lace weight yarn. It is beautiful and delicate, luxorious even. After having researched aggressively to get all the pattern corrections and rewrites and reworks by other knitters, I got my needles in the groove and made serious headway. Yesterday I'd say I was 75% done, and excited that I could see the end and glorious future of this project, and then it happened. I realized I made an error in the pattern, only about 4 rows back. Well, I'm a relatively experienced knitter, and even proud to say I teach error correction. I figured I'd just drop down and correct the stitches, pop back up, and doodlee-dee... carry on. NOPE. I dropped down, wrestled with it, got it carried back up, discovered a problem, dropped down again, and again, and again, and again. My poor husband heard more pirate verse than he's ever experienced in any locker room or bar. Finally, in a fit of rage and self doubt, I pulled the needles. Yes, that's right, took the whole thing off and threatened to frog back the whole project. My supportive husband has recently started knitting, and has learned much about frogging pain through that experience. Two short months ago he might have said "So just rip it out - what's the big deal?" Now he sits at the other end of the sofa and says "Really?!? You're gonna rip that ALL out? Isn't there some way to save it?" I love that man. He gets it. But right now... well... it's one of those moments where even support hurts a little. I started to frog it. I ripped the whole thing back to the drop point. Then... I decided (you may laugh pitifully) I could save it. I tried to thread it back on the needles. No good. I pulled a tapestry needle out and thread it through the stitches I could catch (oh Dear God, why so many yarn overs?!?) and then, I told my husband I felt like crying. And then he said the words... "There are NO tears in Knitting!" I laughed for a second and then I gave up and walked away. So there it sits awaiting its next abuse. And here I sit, a day later and a full roomful away, trying not to look in it's direction, embarrassed and ashamed. I suspect this happens to a lot of projects and fine knitters. I am still full of self-doubt, and wondering What in All that is Soft and Holey I was thinking offering to teach a knitting rescue class. If I can't handle this... who am I to teach it? I am the perfect person to teach it, because I learned from it! I have successfully rescued MANY projects, and honestly, this one isn't dead yet. In fact, it lives to teach. 1) Stop while you are ahead! Back in my earlier computer repair days my coworkers and I would face nasty problems with systems. It would always be temping to work to the solution - hours past logical - hoping against hope that the golden solution would appear before dawn. It doesn't, it won't. That is Hollywood magic/lure. Stop, walk away, and the solution will come to you like lightening. Same with knitting. Do not sit in weak lamp light, overtired, coffee'd and "keep trying". Had I been in my right mind, and walked away from this earlier, I would have gotten it fixed lickity-split in the morning and I'd be holding a finished delight now, instead of typing. 2) Use good light. DUH! I set myself up. I was in the worst condition(s) possible for rescuing my work. If you can't see, you can't stitch or rescue. Why do you think police, fire and rescue all have those huge daylight spotlamps? So they can see where the hell the bleeding is coming from! 3) Fatigue is NOT your friend. My mother will laugh, but I have to use this here - I had Superman Syndrome*. When you are tired, you often will misjudge and think you have the power and control you need. Trust me, you don't. Know thyself Knitter, and knit not when nodding. Further, you'll have a rotten attitude and an even worse attitude in the morning when some know it all reminds you that you were too tired. 4) Perfection requires patience. Don't try to fix anything in a hurry. Again, think of rescue workers, or more to the point, Emergency Room staff. Do you know why you sit for seemingly days in the ER waiting room? Because these experienced professionals know it takes time to do it right. (Yeah, laugh. It's ok. I often believe they want me to heal myself and go home too, but for the purposes of this article... ) If you have any kind of time constraint, you have already added unnecessary subliminal pressure. Work repairs when you have NO time constraints or interruptions. No, don't think "I can do this, I have an hour." It will take two, three, four even depending on how big the project is and how much stress you allow yourself to begin to experience again. Really. Have you ever been out of the ER in under 7 hours for a stomach ache? 5) Steady yourself before returning, and RETURN. High words from someone that can't make eye contact with the yarn yet, but good words, and when I am steady, I will return. This is the ICU of knitting. The point where projects either are abandoned to the project graveyard, or are nursed back to a vibrant life. Think of it in terms of the paramedic - you may be shocked and sickened by what you find, but you steady yourself and return to do the job. Give yourself time, enough time to see clearly, get the sleep and right conditions, and then go back to it. If you banish that project, bar the nurses from attending and hide it away, it will die. Keep that project front and center, carefully observe it, research its illness and administer good medicine, foresaking all other temptations to work on something else and you will save it. Yes, I may end up frogging the whole project. Sometimes, that just can't be helped. Sometimes it is even a good thing, clears the cobwebs of doubt and dismay. You'll be amazed how much better you'll feel if the very next thing you do after winding that ball is casting the project back on and putting on a couple rows. Yes, I may even shed a tear as I rip away at it. Sometimes, that can't be helped either. My husband likes to remind me that adversity makes the journey more memorable. I suspect he's right, and if so, this will be what I'm mumbling about long from now through my dementia years. *Superman Syndrome was actually first observed in my brother, who after staying up late as child to watch the Superman movie was an utter monster of overtired attitude the next day. Mother dubbed it, it stuck. Use it at will. It is a very apt name for this behavior. Adults are affected faster and often experience symptoms before even reaching the next day. There is nothing like visiting fibers at the source! 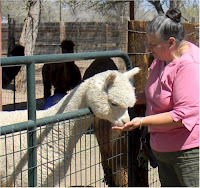 Some of the lovely ladies of our friendly stitchers group went on a field trip this past weekend to Albuquerque Alpacas to visit the crias. The weather was perfect and spring was blooming everywhere. The farm is nestled in North Albuquerque off Alameda in a quiet little neighborhood. You'd never believe there was a major city so near by. We were warmly greeted and brought right out to the holding pens to be introduced. I'm embarrassed to admit I retained very little of the information we were presented with - I was instead enchanted by the farm and it's inhabitants. But I did learn a little. 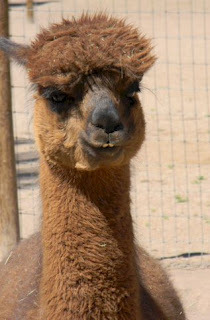 Alpacas are part of the dromedary family; their feet have soft pads like that of dogs, with two large toe nails. I also learned that they only have bottom teeth, with a tough gum palate in place of top teeth, and three stomaches. 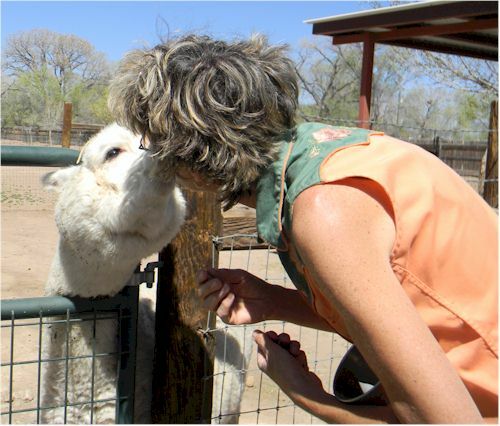 Alpaca waste is "cold enough" that it can be directly composted with immediate benefits. And finally, I learned they have an 11 month gestational period. 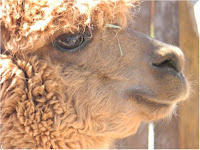 The alpaca are smart animals and some know tricks. One in particular gave kisses and was gentle enough that you could put treats in your mouth for the animal to kiss away, as the owner demonstrated. We each took our turns feeding and petting the babies that were released into a general pen for our enjoyment, then headed over to the on-location fiber shop to delight in the stuffed animals, sweaters, felted hats, socks, dusters, scarves, rugs and, of course, skeins of lucious alpaca fiber. The alpaca farm has also recently added a conference room in which they will be hosting corporate retreat events and classes ranging from spinning to dyeing and weaving to knit/crochet. Special thanks to Jo for co-ordinating this wonderful excursion! So what have we done all winter? Nothing too exciting. Lots of knitting, reading and waiting for the return of good weather. I've spent a large junk of winter knitting. January was dedicated only to finishing projects meant for me, as I often knit for everyone but myself. February I focused on my pattern design work and managed to release three new designs. I also tinkered around with some new techniques - I learned to dye wool with KoolAid and did some felting. March was also a good month for learning new techniques, including lace work, and seeking ways to further improve my craft. I'm looking at taking the Master Knitter Certification course, and hopefully continue on to the Teacher Certification. April 2nd I secured my first teaching gig down at the local yarn store. Details are on my knitting blog - which sadly, I'm better at keeping up to date. John also spent a good chunk of time knitting. One day he up and decided to learn. In two short hours I had him casting on, knitting, purling, working as the row below, and even cabling. He is a natural. 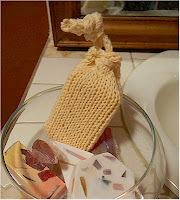 He has since completed a shower soap bag, worked in the round on double pointed needles, complete with yarn overs and an i-cord drawstring (see pic above). Currently he's working on a squid. 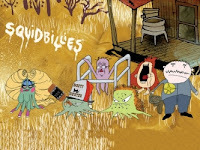 Yes, a squid. Complete with a mullet. John is recreating Rusty, a cartoon character from one of our favorite guilty pleasures "Squid Billies" (he's the 4th squid from the left). The show is a riot and John's recreation of Rusty is fantastic. He has plans to do the major cast. March 6th we planted broccoli, spinach and lettuce in tubs in the house. All are coming up nicely. Lettuce will be ready for harvest beginning in another week. March 19th we sourced our seeds and potato starters and planted Raspberries, a Semi-Dwarf Cherry Tree and a Bartlett Pear in our continuing effort to become more self-sufficient in our food. Haley totally doesn't understand the garden yet, and honestly I'm afraid of the day she figures out there is food in there. She is a devil. She loves to dig. When we planted the trees we fenced them in with leftover plastic fencing from a couple of years back. Within a couple days she had shredded the fencing and John had to replace it with chicken wire. She got a solid scolding. She's dug around the fence a little since, but nothing like the damage she initially did. For the most part now she is focused on the compost bin. We will need to modify that again to keep her out. She's done major damage to a couple of other trees, jumping and tugging. I think she does it more chasing birds than for any interest in the tree itself. We are absolutely amazed at the damage she did to the rosebush - more so due to the volume of huge thorns and lack of damage to Haley than anything. She looks all sweet and innocent, but you turn your back and she becomes one rough tough non-stop destruction tool. John's got the bikes about ready to go. He needs to get the shock rebuilt on his dirtbike, but may be delaying that project for now. The need to get out and play is overwhelming. The weather has been tricky. We did have one deep freeze this year that killed off trees and shrubs. We'll be addressing that once we kick back into our farming activities. For now we are waiting to see the extent of recovery if any, and holding off for the last frost. Until then, some days are gorgeous - we've already seen 85 degrees, and some are dismal - hardly breaking 45 degrees. We've taken Haley on her first hike - only took a couple miles to get the hang of her harness. John's been taking his mountain bike out in the afternoons after work. I've even taken to going for walks during my lunch break. April 2nd I joined one of my knit groups on a field trip to the local Alpaca farm, and discovered which wool I'm allergic to. I've always had a problem with wool, and really stuck close to acrylic to avoid discomfort, but now I know definitively it is Alpaca that I'm allergic to, and need only to avoid yarns and blends. It's a shame really. Alpaca is amazingly soft and the animals themselves are delightful. There will eventually be more on my knitting blog about the trip if you are interested in pictures. Soon we will be breaking out of hibernation. I look forward to summer and motorcycling again. It's just a matter of waiting out the high winds and sand storms now as temperatures continue to climb. Hate ripping back your work to correct errors? This class teaches you how to "read" your knitting and how to correct errors without starting over. You will learn basic stitch anatomy, how to recognize and correct dropped stitches, yarn overs, accidental increases / decreases, twisted stitches, splits, incorrect stitches (I knit when I should have purled, I cabled left when I meant to go right) and how to start and utilize life lines through hands on intentional error creation and recovery. For the final class, you are invited to bring in troubled projects for review and guided correction. Handouts will be provided. Basic knitting skills are required.